As originally envisioned, the Hanford Vit Plant would treat high-level and low-activity radioactive waste simultaneously. 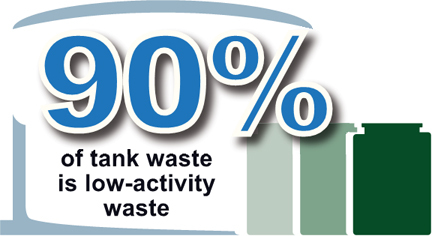 To begin treating waste as soon as practicable, the U.S. Department of Energy developed a sequenced approach that would treat low-activity waste first, as soon as 2022. 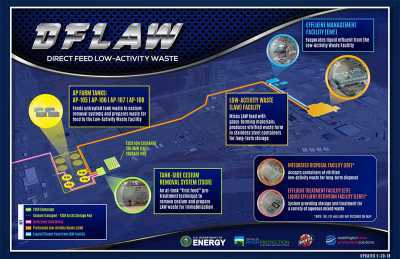 The sequenced approach is called direct feed low-activity waste, or DFLAW. This approach sends low-activity waste from the tank farms directly to the Low-Activity Waste (LAW) Vitrification Facility. 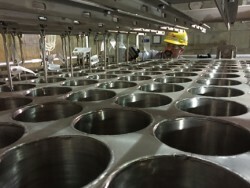 To accommodate DFLAW, a new Effluent Management Facility (EMF) will be built at the Vit Plant. Several of the infrastructure facilities will be modified to handle the capacity reductions needed to support the LAW Facility and EMF only, instead of the entire Vit Plant complex. Watch a video explaining the details of the DFLAW process at https://www.youtube.com/watch?v=JWfAI1Elx4Q. 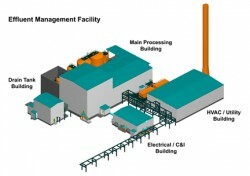 The wet electrostatic precipitator is part of the primary offgas treatment system. The offgas treatment system will remove contaminants from LAW Facility melter exhaust so it meets regulatory requirements for release to the environment. The Effluent Management Facility is needed to handle the liquid secondary waste, called effluent, generated by the LAW Facility melters and offgas treatment system. About 90 percent of the 56 million gallons of waste stored in Hanford’s underground tanks is low-activity waste.